Thank you everyone for your support! Our next Food Festival is Sunday, 2/23/20! Welcome to Temple Beth Or, a historic Reform Jewish congregation in Montgomery, Alabama. We offer many and diverse paths to participate in our temple community. For some, the path is through worship, for others, opportunities to pursue social action and join in social gatherings. Education, both youth and adult, is important to many, and a sense of belonging to a community is often central. Whatever your reason or reasons, please come and visit. 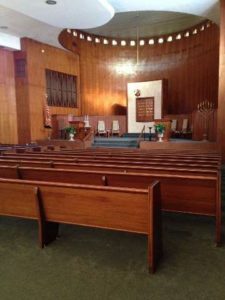 All are welcome at our Shabbat service every Friday evening, usually held between 6:00 p.m. and 7:00 p.m. Please check our Calendar for specific timing and other events you may find of interest.